You'll be £6.00 closer to your next £10.00 credit when you purchase SAS Zero Hour. What's this? Britain’s elite Special Air Service Regiment, the SAS, is one of the most revered – and feared – special-ops units in the world. Its high-profile operations include the spectacular storming of the Iranian Embassy in London on 5 May 1980 and the hunt for Osama bin Laden in southern Afghanistan following 9/11. The regiment has become a byword for the highest possible standards in both conventional and unorthodox methods of warfare. But where did it all begin? In this compelling book, Tim Jones tackles this fascinating question from a fresh perspective. It is commonly held that the regiment was the brainchild of just one man, David Stirling. While not dismissing Stirling’s considerable contribution to the regiment’s genesis, Jones’s insightful investigation identifies all of the major factors that played a part in shaping the SAS, including the role of such notables as Dudley Clarke, Archibald Wavell and Claude Auchinleck, among others. 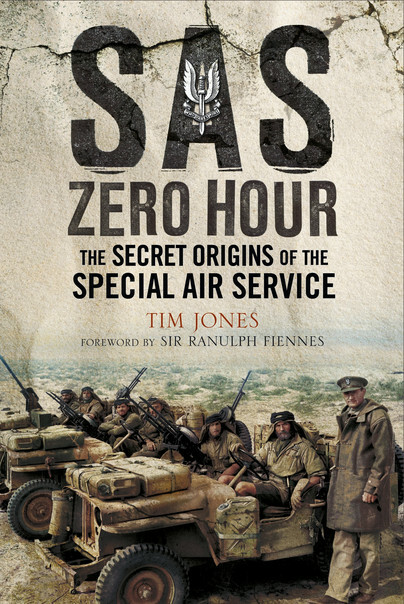 Drawing extensively on primary sources, as well as reassessing the more recent regimental histories and memoirs, SAS Zero Hour is an illuminating and provocative account of how this renowned regiment came into being. He is said to have come up with one of the most famous armed forces regiments in history from a hospital bed before sneaking into military headquarters to make sure his plan was heard. Many believe Sir David Stirling, known as the father of the SAS, was the man solely responsible for its creation. But a new book has uncovered the 'secrets' around its origins and claims there were a number of other figures vital to the SAS's development, including an intelligence officer who originally came up with the name to try to trick the Italians into fighting a fake unit. A worthwhile exploration of why the SAS was created. Based on primary sources, this is an outstanding account of the early days of the SAS. Today, the SAS is a premier special forces group, known around the world and the example of professional dedicated service to the highest standards – Much Recommended.